We have seen some incredible insights, success stories and announcements over the last 3 days at #SuiteWorld19. With so much to celebrate, Day 3 ended with the spectacular GloFest. Shaquille O’Neal made an appearance as the DJ following his discussions in the keynote earlier that day. The event marked the final evening of SuiteWorld in 2019. On Day 4, the sessions and networking buzz continued throughout the day. With over 70 sessions to attend, the range of insights to be heard meant that there was something to suit all industries. Topics included project management, implementation in retail to next-generation custom transactions. Let’s take a look at some of session highlights below! Evan Goldberg highlighted in the opening keynote how NetSuite has enabled nonprofits to gain visibility. What that has meant ultimately, is that with digital transformation they have a better platform to tell their stories. In the sessions the theme remained as Goodwill attended to discuss the success they have achieved using NetSuite. Goodwill Industries International Inc. is an American non-profit organisation that provides employment placement services, job training and other community programs all designed to help those who have barriers in finding employment. 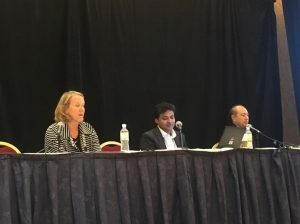 Gari Ann Douglass (Goodwill’s Chief Financial Officer) and Sharat Surve (Goodwill’s Manager, Finance Strategy & Business Systems) detailed how using data optimisation can be used to further social impact. Since implementing NetSuite, they have been able to achieve automation for their processes. Enabling this change has meant a complete transformation of their back end operations. By unifying their systems into one single integrated platform they were able to gain financial visibility. This enabled simplified reports for stakeholders, audit controls and transparency. This kind of success story demonstrates why NetSuite is now a model of choice for nonprofits. On Day 3 Jason Maynard explored how the accumlication of listening to NetSuite users over the years has resulted in the realisation of 3 elements which need to be aligned to achieve business success. These elements are: Mission, Strategy and Execution. We heard how NetSuite is continually evaluating enablers to increase alignment for businesses. Continuing this theme into the sessions we delve into how restructuring for future success is achieved through NetSuite. Matt Bonser (Director of PwC), Gerson Rodriguez (Manager Product Management, Oracle) and Sean Murphy (NetSuite Systems Manager, Walton Signage) discuss all things change management. Change management is the structured approach in making changes to a business in order for it to align with future goals. In the session they discuss how this process can be improved in NetSuite using the SuiteCloud Development Framework (SDF). What a fantastic four days #SuiteWorld19 has been – but all good things come to an end. We have seen some fantastic collaborations this year including the teams who worked on Hackathon 4Good. The Grow Beyond topics took us on a journey with a wide range of guest speakers on the success achieved with NetSuite. We’ve learnt how the creation of enablers such as Grow Wire and SuiteSuccess Planning & Budgeting are supporting scalability in businesses. We also had some great announcements this year from innovative projects including Brainyard which is set to change the way the tech industry share’s it’s future insights. SuiteWorld was bigger than ever this year, and as it grows NetSuite continue to push the boundaries in order to give businesses the tools on how they can truly reach their True North.